An extraordinary offering just crossed my desk – – A private ski resort (larger than Aspen Mountain) encompassing 2,000 acres on the edge of the Uncompahgre Wilderness between Telluride and Crested Butte. · Only a 45 minute drive or an 8 minute helicopter ride from the Telluride / Montrose Regional Airport offers easy access to this wilderness retreat. · The ski mountain is fully operational and equipped with luxury, heated snowcats and tours of the property with a sampling of skiing is available upon reservation. · With a limit of four club members and their families per ranch, there will be no crowds or lift lines – just plenty of guided skiing of untracked powder for days after each snowfall, as well as lots of well-groomed runs. There’s even heli-skiing available. · With miles of biking, hiking and equestrian trails, the Cimarron Mountain Club will also be a welcome retreat in the spring, summer and fall with expert resident guides for fly fishing its lakes and ponds and exploring the vast surrounding wilderness. 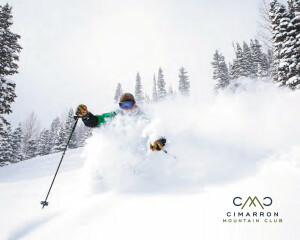 · The owners of CMC are debt-free and have a Board of Directors who are leaders in the ski and resort communities – – including a member of the Colorado Ski Hall of Fame, former CEOs or COOs of Vail Resorts, Beaver Creek Resort, Aspen Skiing Company, Crested Butte Mountain Resort and Telluride Ski Resort, and the current COO of Auberge Resorts, not to mention the Chairman of the Colorado Parks and Wildlife Commission. · A vast amount of infrastructure is in place with plans for construction of a base lodge and owners’ cabin scheduled to commence construction shortly after the first threshold of sales are closed in late spring 2015.